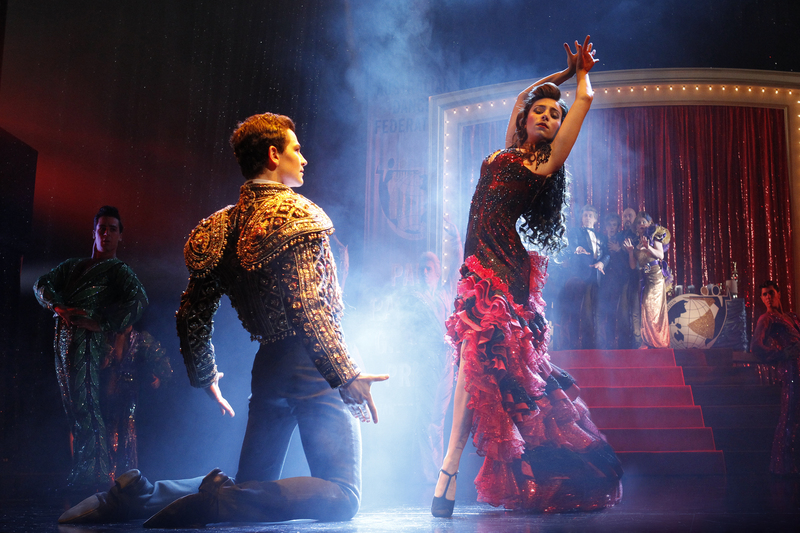 There’s a dazzling image at the start of Strictly Ballroom the Musical of the dancers standing silhouetted in a line across the back of the stage. As they start to move forwards, the lights come up on them in their sensational, sparkling costumes and the heart races. You can feel a shiver of excitement in the audience and the collective hope that Baz Luhrmann has managed to turn his beloved, uplifting 1992 film about daring to be true to yourself into an equally successful musical. Luhrmann does deliver an enjoyable show but, frustratingly, Strictly Ballroom never truly soars. The buzz begins as soon as the audience spots the shiny, coloured covers on the theatre seats inside the auditorium. It’s a measure of their willingness, indeed eagerness to embrace the musical that they enter with such gusto into the pre-show audience participation routine, led by DJ JJ Silvers (Mark Owen-Taylor), which has them barracking for dance couples wearing costumes to match the coloured section in which they are sitting. From there, the story of rebellious dancer Scott Hastings (Thomas Lacey) and wallflower beginner Fran (Phoebe Panaretos), who blossoms as his partner, has been translated to the stage in straightforward fashion without being re-imagined afresh. Most problematically, the score is a real mish-mash. Granted, the key songs from the film (“Time After Time”, “Perhaps, Perhaps, Perhaps” and “Love Is In The Air”) need to be there; the audience would be disappointed if they weren’t. But around those, Luhrmann and his team have added some largely unmemorable new numbers (some with a pop feel, one influenced by Les Mis) and put lyrics to Strauss’s Blue Danube and the “Habanera” from Bizet’s Carmen, which comes across as a cheap move. With the exception of Eddie Perfect’s rousing, Russian-inflected “Dance to Win” for Barry Fife (Robert Grubb) the songs rarely deepen character, heighten emotion or advance the plot as they do in a good musical, while the lyrics are at best ordinary. “Time After Time”, which Scott and Fran sing under the Coca-Cola sign, comes closest to transporting us – again you start to feel your heart race, your spine tingle – but Luhrmann interrupts it with cuts to Scott’s father Doug (Drew Forsythe) in the studio below and the mood is broken. Several important choreographic moments also fail to take flight. Scott’s first big solo dance, when he expresses his frustration and desire to dance his own steps, hardly dazzles with unorthodox choreography. What’s more, cast members wheel four large mirrors around him. You expect there to be a thrilling interplay of reflections, but no. For the most part, they just block your view. Scott and Fran’s climactic dance also falls a bit flat. It’s the exciting paso doble led by Fran’s father (Fernando Mira) that emerges as the dance highlight. In a way, that’s as it should be for it’s here that Scott encounters genuinely passionate dancing from the heart, but it shouldn’t eclipse Scott and Fran’s final, defiant routine. Catherine Martin’s glittering costumes are stunning though, a real triumph. Everything that could possibly glitter does from gorgeous dresses with layers of floating tulle to itsy-bitsy sequined numbers to sparkly jumpsuits for the boys. Martin’s sets also work well. Various sections are wheeled around by the cast, in a whirling dance of their own, to create different settings – though there are times when Luhrmann has them spinning more than is necessary. In the central roles, newcomer Phoebe Panaretos is lovely as Fran. She has a sweet voice and a truthfulness that makes for some of the most moving moments, while Thomas Lacey has an appealing presence as Scott. He has a light voice but he dances well, though he could with a bit more fire in the belly and a sharper, sexier swagger. An experienced cast does a fine job in the fairly broadly drawn supporting roles. Everyone does their bit but standouts include Heather Mitchell, who does a superb job in finding some emotional nuance as Scott’s pushy, highly strung mother, Robert Grubb, who is an entertainingly large, comically malevolent presence as the conniving Barry Fife, Drew Forsythe, who is amusingly dorky as Scott’s timid, put-upon father and Natalie Gamsu, who brings passion and welcome powerful vocals as Fran’s grandmother. The ensemble is also terrific. 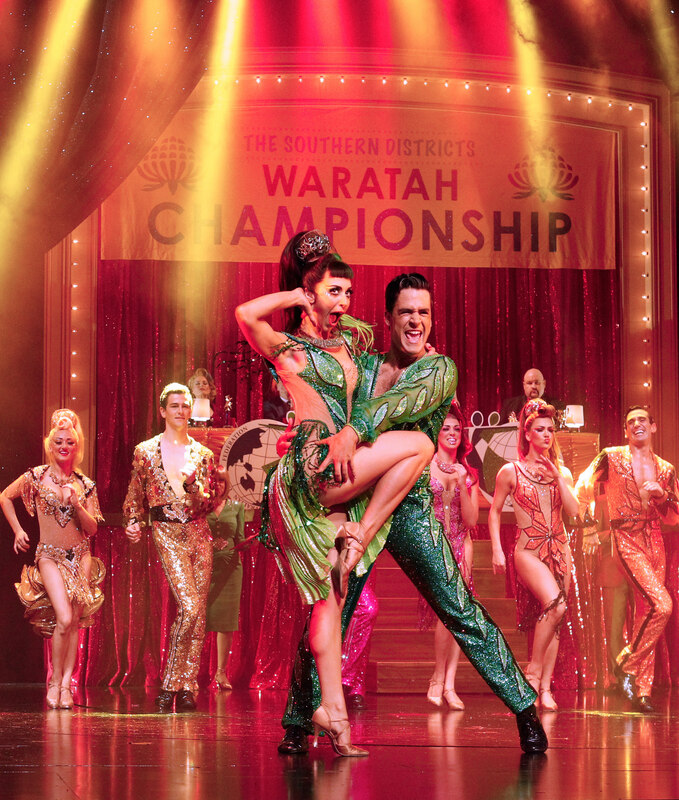 As it stands, Strictly Ballroom has enough going for it to be a crowd-pleaser – by all reports audience are lapping it up – but it could be so much more. Hopefully Luhrmann will develop it further. This entry was posted in Musical Theatre and tagged Baz Luhrmann, Catherine Martin, Cristina D'Agostino, Drew Forsythe, Eddie Perfect, Heather Mitchell, Mark Owen-Taylor, Natalie Gamsu, Phoebe Panaretos, Robert Grubb, Ryan Gonzalez, Thomas Lacey by jolitson. Bookmark the permalink.